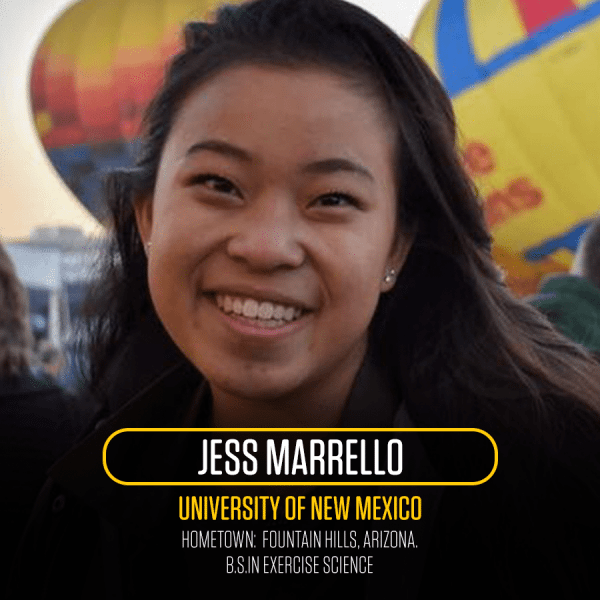 From the thousands of graduating seniors who have participated in Miracle Network Dance Marathon at the approximately 300 colleges and universities across the U.S. and Canada, twenty students were selected to receive the 2018 Miracle Network Dance Marathon Distinguished Leadership Award for making an exceptional impact within their Dance Marathon program, on their individual campus and for their local Children’s Miracle Network Hospital. To see all of this year’s recipients, click here. Dance Marathon Involvement: During my four years involved with LoboTHON at the University of New Mexico, I personally fundraised $6,679 and held the following positions: Event Operations Committee member, Event Operations Director, Finance Executive Director, and Executive Director. Campus/Community Involvement: New Student Orientation Leader; member and New Member Educator of Chi Omega; undergraduate intern for the Exercise Physiology lab at UNM; STEM tutor for the Center for Academic Program Support (CAPS); Mortar Board Senior Honor Society; Associated Students of the University of New Mexico Elections Commission Assistant Director; Panhellenic Recruitment Guide; volunteer at Carrie Tingley Hospital: Outpatient Rehabilitation. Post-Graduation Plans: I will be attending Physical Therapy school at Northern Arizona University. I hope to become a pediatric physical therapist with a specialty in neurological disorders. First and foremost, I became involved in Dance Marathon because simply put: I love dancing. Any kind of music, any place, any time, I live to dance. When I first heard of Dance Marathon, I really thought it was only about dancing. Once I discovered what Dance Marathon actually was, who it supports and what it stands for, my love for the organization only grew. Dance Marathon truly combines my two biggest passions: dancing and service. I love that Dance Marathon not just an organization or an event, but it’s a community. It’s a gathering of the most passionate, driven, inspirational students who have all set aside a day dedicated to bettering the lives of thousands of children. I continue to participate in Dance Marathon because there is nothing like seeing the eyes of a child light up when they see that thousands of college students have dedicated a day just for them. There is nothing like having a parent come up to you and thanking you for your devotion to raising funds for the hospital that saved their child’s life. There is nothing like seeing a room chock full of people, who believe in the cause, believe in themselves to rise to the occasion, and believe in the campus as a whole to cross the finish line together. Dance Marathon is unlike any other experience, and to think of my undergraduate experience without it seems incomplete. Jess with a Miracle kid at a LoboTHON event. Of all of the activities I have invested my time in during my undergraduate career, I can say without a doubt that LoboTHON has taught me more than any other organization about what true student leadership, the power of unity, and my ability to overcome adversity. LoboTHON taught me how to lead by example, as this is essential to the level of success we can achieve as an organization. I made myself a resource for all of my team members and tried to set an example through my own personal fundraising strategies. I also tried to guide the directors as much as possible in planning and hosting fundraising events, and I was always willing to go outside the scope of my duties through assisting anyone who needed help with the project they were assigned. My style of student leadership has become more service leadership-oriented because of LoboTHON. This has shown me how important it is to express gratitude toward your team, and anyone supporting your team. The power of “we” and uniting a team successfully comes from making sure every team member, and even every participant in Dance Marathon feels valued and appreciated. Finally, such large-scale impact does not happen overnight; however, and challenges were always around every corner. LoboTHON has been one of the greatest teachers in learning how to deal with adversity. I remember on the day of the Dance Marathon when I was Executive Director, Johnson Gym had accidentally double booked our group and a basketball tournament. Fortunately we got it sorted out, but it just goes to show that adversity will pop up even when you think you’ve prepared in every way possible. LoboTHON has taught me that keeping your outlook optimistic, owning up to your mistakes when they occur, keeping yourself accountable, and asking for help when you need it will help you survive whatever life throws at you. My involvement in Dance Marathon has given me more confidence in my abilities than any other organization, and has armed me with tools that I will undoubtedly use later in life. The contribution I am most proud of from my involvement in Dance Marathon is my time spent as Executive Director of our program, LoboTHON, during my junior year because it taught me so much about myself, about service leadership and about the incredible power each of us has to produce good, positive change. If you had told me a few years ago that I would someday become the Executive Director of my university’s largest student-ran philanthropy, I would have never believed you. I served as the Event Operations Director during my sophomore year, and numerous times I thought about quitting because of the sheer amount of stress, frustration and despair I felt as a result of how inexperienced I felt about running our 13.1 hour event. Additionally, there was an undeniable pressure of trying to follow-up a successful event from the previous year. Through the power of an amazing team, passion, inspiration from the Miracle Families and a determined group of individuals, we were able to pull off the Dance Marathon successfully. Though our fundraising total took a dip that year, I left the gym we held our event in feeling more inspired than I ever had. Before that moment, I truly believed my time in LoboTHON was over; little did I know this was only the beginning. I am so proud of my time as Executive Director because applying for the position was a leap of faith I never would have expected myself to take. It was from this moment forward that my life began to look like little leaps of faith on a daily basis. Holding the position of Executive Director brought me challenges I had never experienced, but was able to overcome. I had never been the face of an organization. I was tasked with building a new committee after turnover from the previous year. When I look back on my time as Executive Director, all I see are some of the most precious memories I’ve made at UNM. Every moment I spent with my team I cherish, even when we disagreed or felt close to exhaustion, because learning, serving and growing with them made me a better leader. I am proud of the passion I was able to instill in numerous committee members to motivate them to serve LoboTHON the following year. I’m proud of my team and our ability to change the perception of Dance Marathon on our campus, raise a then record amount for our program of $51,230, and bring dancer and committee morale to an all-time high. Jess at LoboTHON’s Dance Marathon event. Dance Marathon is one of the most inclusive organizations on campus. Dance Marathon is for everyone whether you’re a good dancer or a bad dancer. In fact, our motto one year was “Bad Dancing Saves Lives.” Though it may be naïve or cliché, Dance Marathon is magical. It is a community in which thousands of students have put the lives of others before their own. Dance Marathon accepts you for who you are. 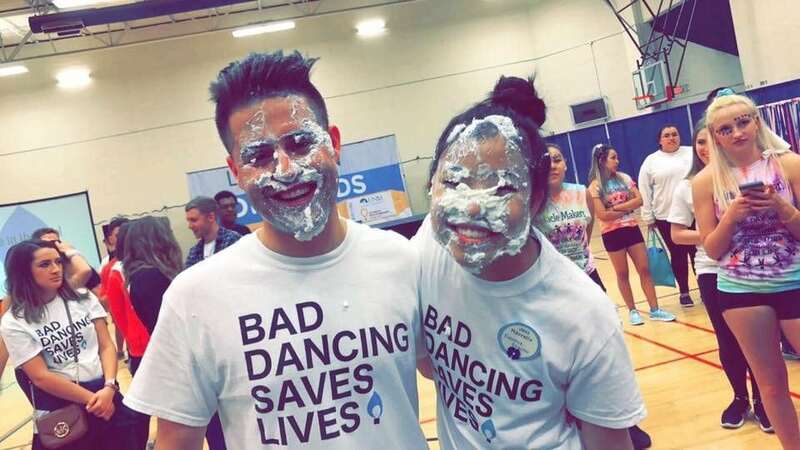 Dance Marathon accepts you when you’re sweaty, exhausted, decked out in a tutu, in need of a change of socks, or covered in whip cream from being pied in the face. Dance Marathon is a community where you can get down to your favorite jams, while simultaneously being inspired by some of the biggest heroes I know: our Miracle Kids and their families. Every story is different, but for a moment in time, each of our individual narratives all intersect, and we stand together united in one mission: For the Kids. People should donate to their local Children’s Miracle Network Hospitals because they serve countless families and children across the nation who are often times facing a battle every single day. Children and their families should not have to bear the financial cost of childhood illness on their own, as illness is far too much to bear already. We donate to ensure that no child or family fights alone. Until the doors are closed and Children’s Miracle Network Hospitals are no longer needed, there will always be work that needs to be done. Whether we are raising funds or raising awareness, this work is essential to continue saving the lives of countless children. Futures are being reclaimed. Families have an ally in the battle against childhood illness. Together, we are fostering hope, health and happiness in hopes that the next generation can dance in celebration. 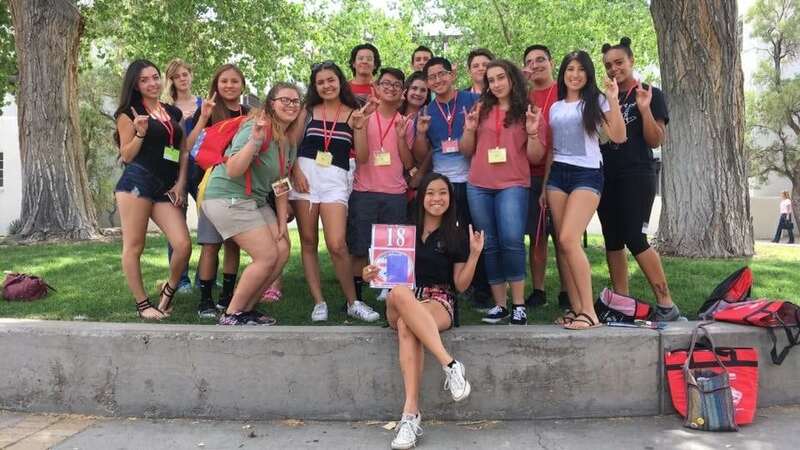 Jess with some UNM freshmen during her time serving as a New Student Orientation Leader. Miracle Network Dance Marathon is an international movement, involving over 400 colleges, universities and K-12 schools across North America that fundraise for their local Children’s Miracle Network Hospitals. 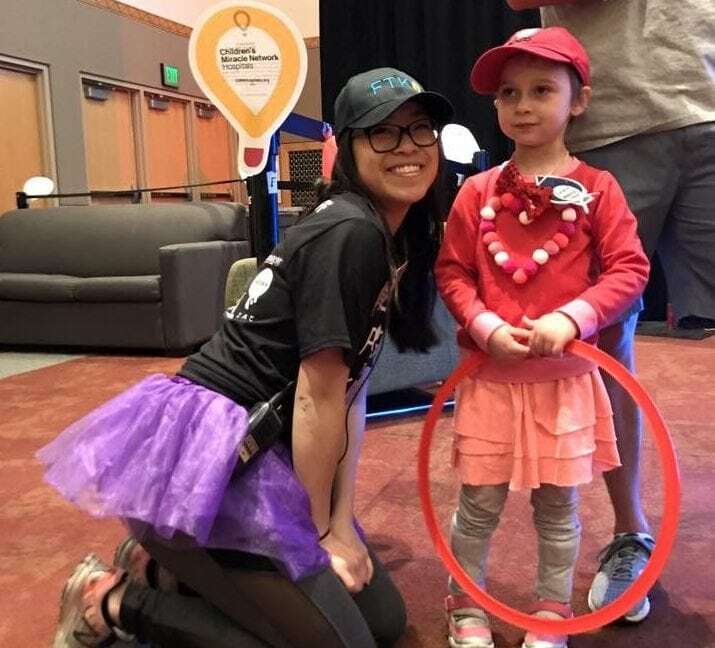 Since its inception in 1991, Miracle Network Dance Marathon has raised more than $220 million–ensuring that no child or family fights pediatric illness or injury alone.